If you're new to Magic or looking for a refresher on the basic rules, check out the Learn to Play page. Innistrad is a plane filled with savage monsters, strange transformations, and sinister magic. This article will walk you through the major new and returning mechanics of Innistrad, as well as a new evergreen rules term debuting in the set. ...So what does that mean exactly? For the nitty-gritty details (including how to draft with double-faced cards) and weird corner cases, check out the Double-Faced Card Rules Page. We'll cover the basics here. A double-faced card has, as you'd expect, two faces. It has no regular Magic back. Its front face, which is marked with a sun symbol and has a mana cost, is the default. A double-faced card always enters the battlefield with its front face up. This is true whether it enters the battlefield from the stack as the result of being cast, or from anywhere else, such as your graveyard (due to a card like Zombify, for example). Each double-faced card has at least one ability that causes it to transform. To transform a double-faced card, you turn it over so that its other face is showing. To put a double-faced card into your deck, you have two options: You can put your entire deck in opaque card sleeves, as many players already do, or you can use the checklist card provided in manyInnistrad packs. If you're using checklist cards to represent any of the double-faced cards in your deck, you must use checklist cards to represent all of them. 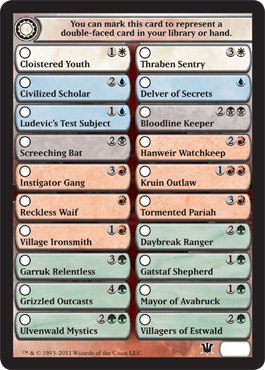 You'll use the checklist card when the card is in your library, in your hand, or exiled face down, and the double-faced card when the card is on the stack, on the battlefield, in the graveyard, or exiled face up. After a double-faced card transforms, it's still the same card, so any Auras, counters, or other effects stay right where they are (unless the double-faced card's characteristics have changed such that an Aura can no longer legally enchant it). The word "transform" applies no matter which side is currently showing. In other words, Gatstaf Shepherd might transform into Gatstaf Howler, then Gatstaf Howler might transform into Gatstaf Shepherd. Those are the basics. If you still have questions about how double-faced cards work, check out theDouble-Faced Card Rules Page! In Innistrad, the death of one may be an opportunity for others. 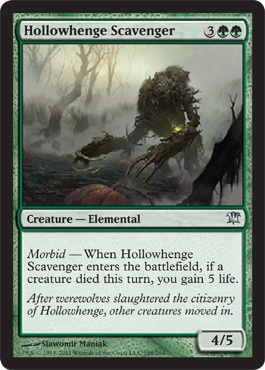 Hollowhenge Scavenger's ability triggers when it enters the battlefield if a creature died at any point in the same turn prior to that. If no creatures have died, it doesn't trigger. It doesn't matter if a creature dies later in the turn; the ability triggers either when Hollowhenge Scavenger enters the battlefield, or not at all. Other morbid abilities may be triggered abilities, activated abilities, or abilities that change what an instant or sorcery spell does. The flashback mechanic makes its return in Innistrad. Flashback appears only on instants and sorceries. You can cast a spell with flashback from your hand as normal. When it's in your graveyard, regardless of how it got there, you can cast it by paying its flashback cost instead of its mana cost. You can do this only at a time you could normally cast the card. If you cast a spell for its flashback cost, it's exiled as it leaves the stack. A Curse is an Aura that enchants a player and does something nasty to them. There aren't any special rules for Curses—they follow all the normal rules for Auras that enchant players—but there are some cards in Innistrad that refer to the Curse subtype. 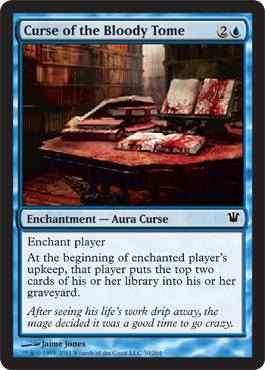 Note that Curses have enchant player, not enchant opponent, so you can enchant yourself with a Curse if you want to. In addition to its block mechanics, Innistrad introduces a new evergreen rules term, fight. The damage is dealt simultaneously, and it is dealt by the creatures themselves, so abilities like deathtouch, lifelink, and infect will work as normal. Damage dealt while fighting is not combat damage, so abilities like first strike won't have any effect. Fighting doesn't cause the creatures to become tapped. No more than two creatures can fight. If a creature somehow fights itself, it will deal damage to itself equal to its power twice simultaneously. A few old cards with the same functionality, such as Rivals' Duel, will receive updated Oracle wording using the new terminology. Cards with similar, but not identical, functionality will not use the word "fight."